Antonia Yordanova Atanassova., et al. Intra-Abdominal (Mesenteric) Desmoid Tumors (Dts) after Kidney Transplantation: A Case Report. (2017) J Gastrointest Disord Liver Func 3(1): 100- 103. © 2017 Antonia Yordanova Atanassova. This is an Open access article distributed under the terms of Creative Commons Attribution 4.0 International License. Desmoids tumors; Kidney transplantation; Immunosuppressive therapy; Small intestine resection; Recurrences. Desmoid tumors are benign neoplasms, but are often unresectable because of their aggressive and local infiltration, compression of surrounding structures and massive involvement of adjacent vital structures. Our aim is to increase awareness of this condition so that clinicians will consider diagnosing it. This will facilitate prompt diagnosis and treatment. This is a case of a 43 year old woman with medical history of Berger`s disease, immunosuppressive therapy, a kidney transplant and sporadic mesenteric desmoid tumors appearing after solid organ transplantation. Eighteen months after the removal of the tumors, she was diagnosed with essential thrombocytosis. No evidences of recurrence after operation. Desmoid tumors often appear as infiltrative well differentiated firm overgrowths of fibrous tissue with locally aggressive behavior. Surgery has been the traditional main mode of therapy but up to 20 - 50% of these tumors had recurrent after surgery. The course of the disease and the tendency for recurrence make the treatment of these relatively rare fibrous tumors challenging. This is the second documented case of desmoid tumor appearing after solid organ transplantation. The patient has no personal or family history of familial adenomatous polyposis. Incidence and recurrence of sporadic mesenteric desmoids in patients who have undergone transplantation and the effects of immunosuppression on desmoid development have not yet been elucidated. 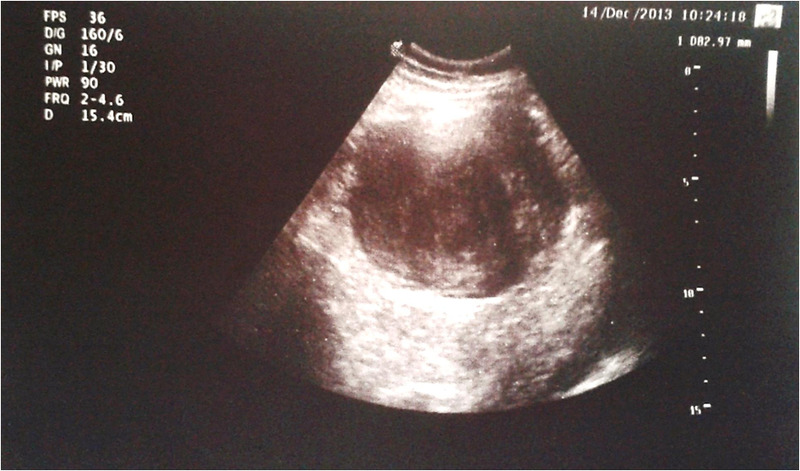 Figure 1: Abdominal ultrasonographic image showing regular hypoechoic mass with distinct margins. Figure 2A: CT scan showing large parenchymal lesion (red arrow in the right) with axial size 11/8, 6 cm, craniocaudal size 10, 2 cm, with primary density 25 HU and post-contrast density 55 HU, non-homogenous. Second parenchymal formation (red arrow in the left) with the same CT scan characteristics and size - 3, 9/2, 9/3, 7 cm. Figure 2B: Coronal reformatted image demonstrates the two lesions and a kidney transplant. 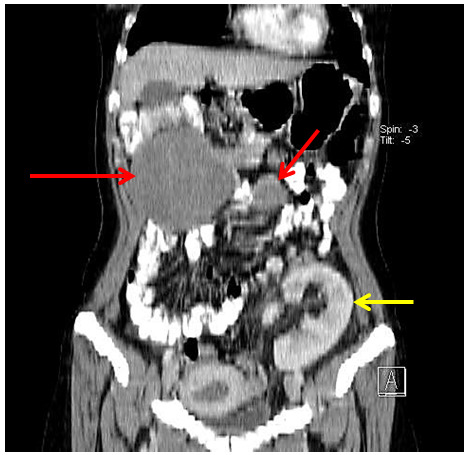 The kidney transplant contrasted homogenously (yellow arrow) with size 12, 9 cm was situated in the left iliac region with anastomosis with the external ileac vascular bundle. The CT scan presented normal imaging of liver, spleen, adrenal glands, lung parenchyma, mediastinal lymph nodes, and bone structures. The mesenteric lymph nodes and the lymph nodes around the iliac vessels were normal up to 7 mm. The esophagogastroduodenoscopy and colonoscopy showed no deviations from the norm. A multidisciplinary team of surgeons and the nephrologists who observe the patient after the transplantation discussed the case. A resection was made of the two tumor masses and parts of the small intestine. The larger resection was 50 cm of the small intestine, the smaller one was 20 cm of the small intestine. There were two tumor lesions firmly adhered to the intestinal wall without infiltrating it. The intestinal wall is with preserved histology and there’s no microscopic evidence of tumor infiltration (Figure 3A, B, C). 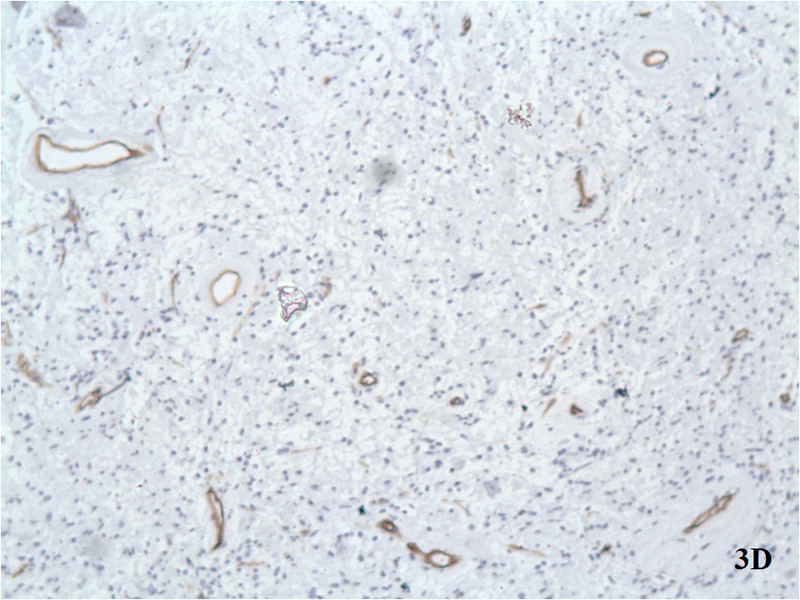 Immunohistochemical test: the tumor cells test negative for SMA (Smooth Muscle Actin), desmin and S 100 protein. No expression of monoclonal anti-CD34 and anti-CD117 antibodies (Figure 3D, E, F). 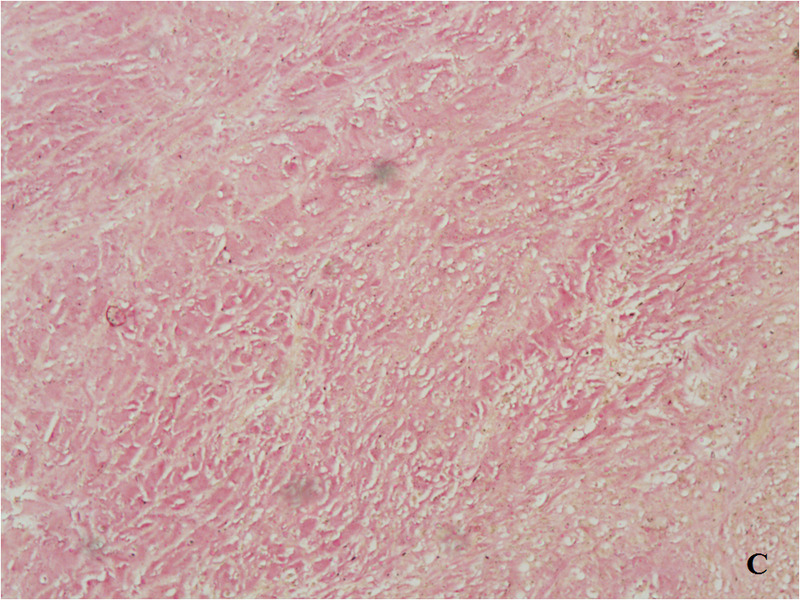 The histology data shows that this abdominal desmoid fibromatosis. No complications and complaints after the surgical intervention. The clinical laboratory tests continue to show persistent thrombocytosis: Platelets 720 x 109/l, 860 x 109/l, 931 x 109/l (130 - 400 x 109). A bone marrow examination was performed with data of myeloproliferative neoplasm - essential thrombocytosis. The molecular testing of genes presents: heterozygous carrier of mutation of the JAK V617F 2 gene. Hydroxycarbamide (Hydrea) treatment was started with evidences of reduction of the thrombocytosis: Platelets 580 x 109/l. B. 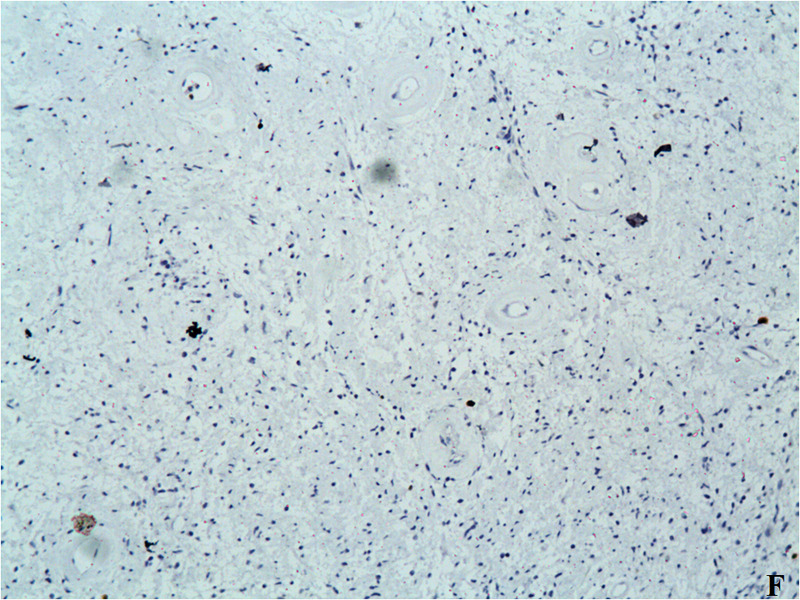 (H&E stain, x20): High magnification showed that the tumor lesions consist microscopically of monomorphic elongated spindle cells with small uniform regular nucleus, no nuclear hyperchromasia (with small pale nuclei with small nucleoli), without cytological atypia (with scarce mitoses), amidst collagenous stroma with well-defined blood vessels. D. All tumor cells were negative with monoclonal anti-CD34 antibody. 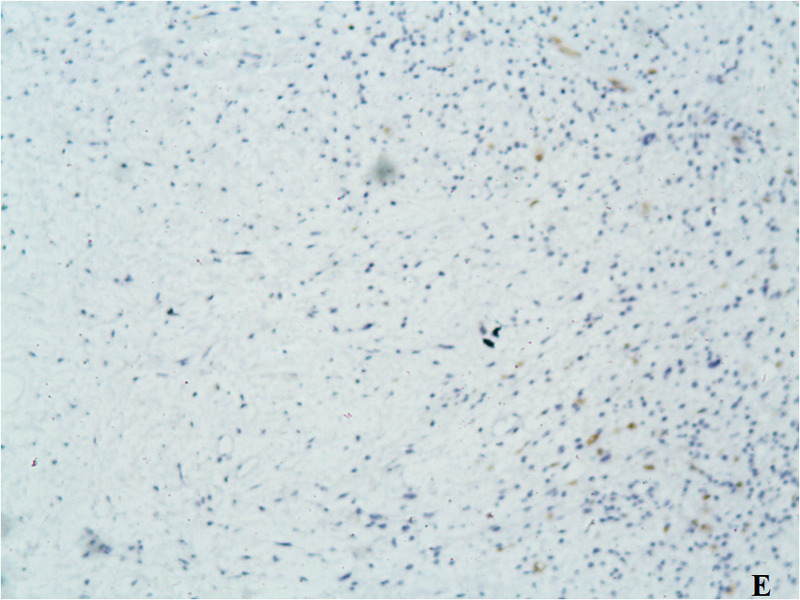 No expression of CD34. E. All tumor cells were negative with monoclonal anti-CD117 antibody. No expression of CD117. F. Ki-67 Low proliferative activity (below 5%). At the time of the follow-up, thirty six months after the surgery to remove the tumors, she has no complaints and complications. The abdominal ultrasonography and the full-body CT scan show no data of a relapse. Good results of the treatment with Hydroxycarbamide, continues to take the medication. The transplanted kidney functioned normally. Desmoid tumors are considered rare, with frequency of 2 to 4 cases per million per year; they are reported to account for 0, 03% of all neoplasms. They are most common in people between the ages of 10 and 60, the peak is around the ages of 30 or 40, but they can occur in younger and older people. DTs belong to the family of family of fibroblastic proliferations that include a variety of fibromatoses. They are benign tumors composed of fibrous elements. DTs may occur in the abdominal wall, in the mesentery, or the retroperitoneal cavity. They can also be extra-abdominal: shoulders, limbs, chest, neck and scrotum[2,3]. DTs are histologically qualified as benign and do not metastasize but they are often highly recurrent and locally invasive. 85% are FAP-associated (Familial adenomatous polyposis), and only 5% are sporadic. Repeated irritation or trauma to a certain part of the body, including surgical trauma, estrogen has been theorized to increase the risk of desmoid tumor occurrence. DTs grow fast and depending on their localization can cause pain, nausea, vomiting, weight loss, obstruction or perforation of the small intestine, enterocutaneous fistula and intestinal bleeding. During gross histopathologic examinations DTs most often are seen as circumscribed lesions, but they also can have irregular borders. They are usually larger than 5 cm and can reach up to 15 cm. In 10 - 15% of cases they are multiple. 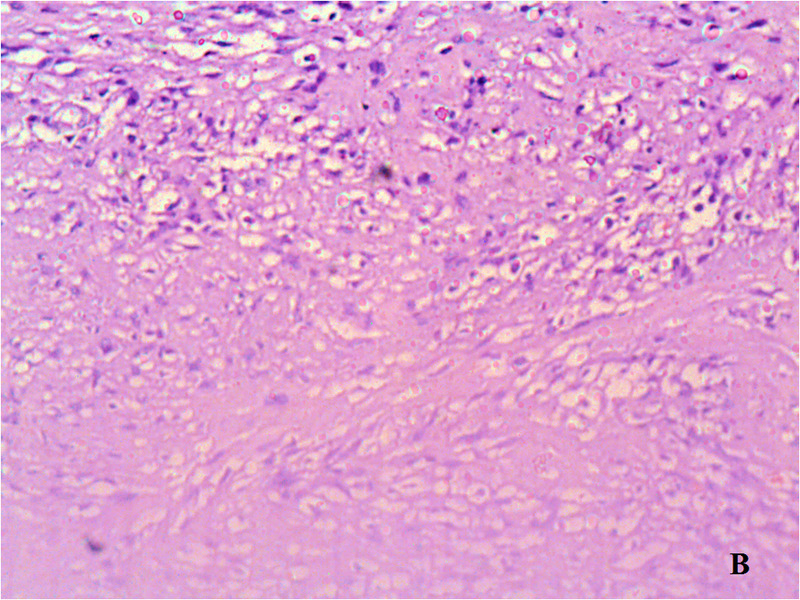 Histologically, DTs are lesions composed of bland spindled or stellate fibroblastic cells embedded in a collagenous stroma, without evidence of muscular or neural differentiation and with little or no inflammatory component. 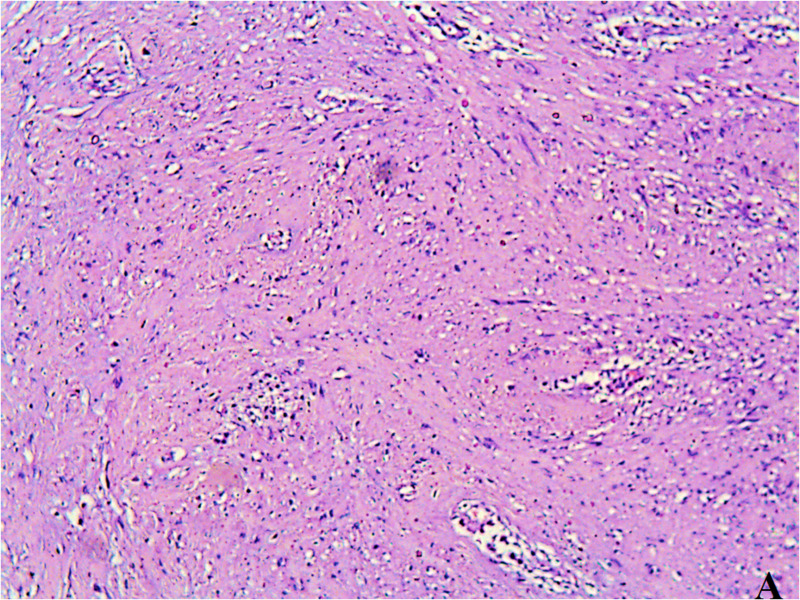 The tumor may infiltrate adjacent viscera and tissues at the periphery. On a CT scan, most desmoid tumors appear as well-circumscribed homogeneous masses that may be isodense or hyperdense relative to muscle. Some cases of heterogeneous masses with infiltrative outer margins are seen. Desmoid tumors may enhance after injection of IV contrast material, localizes the tumor and excludes metastasis. Treatment for these tumors includes a wide variety of approaches. The surgical treatment’s goal is to preserve the functional capacity and to have tumor-free—negative—margins. However the positive surgical margins are connected to the increasing risk of recurrent disease. In patients in whom surgical resection is not feasible, radiation therapy (RT) can be given as the definitive therapy. Surgery and/or RT and chemotherapy can cause significant morbidity and even mortality. Medical treatment usually comes to the forefront when surgery and radiation cannot be used or have failed. It can include individualized combinations of anti-hormone agents, tamoxifen or raloxifene; non-steroidal anti-inflammatory drugs such as ibuprofen or naproxen; targeted chemotherapy with imatinib mesylate; and/or traditional cytotoxic chemotherapy. Kinase inhibitors are also being used in the treatment of desmoid tumors. Patients with asymptomatic or minimally symptomatic disease and with stable appearance on screening modalities may appropriately be treated with a period of watchful waiting. 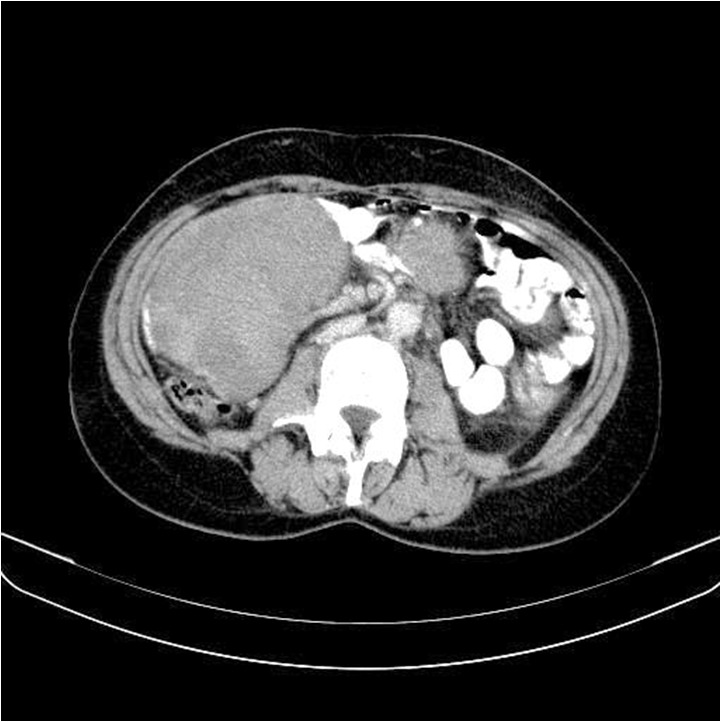 The first case of intra-abdominal desmoid tumor following a liver transplantation was described recently. Despite the achieved grossly negative resection and the pathology that revealed microscopic disease at the margins, the patient received no adjunctive therapy. The DT has not recurred after 23 months. In this case it is a sporadic mesenteric desmoid tumor. Despite the minimal abdominal discomfort, the only possible treatment was surgery followed by observation. The surgical treatment achieved macroscopic and microscopic tumor-free-negative-margins. She received no adjunctive therapy but the DT has not recurred at 18 months, suggesting that her immunosuppression has not caused rapid growth or recurrence. The observation showed that our patient developed another neoplastic process–essential thrombocytosis, which responded well to the treatment. Desmoid tumors are benign neoplasms, but are often unresectable because of their aggressive and local infiltration, compression of surrounding structures, massive involvement of adjacent vital structures and a significant tendency to relapse. The clinical case gives information on two intraabdominal desmoid tumors discovered at the same time – 7 years after a kidney transplantation. The 3 year time frame of observation and consecutive abdominal echographies and abdominal CT confirms there is no recurrence of the tumors. It is still not clear if there is a connection between transplantation of solid organs and the immunosuppressive therapy and the appearance of sporadic DTs. It is unknown if the surgical intervention i.e., transplantation is a triggering factor or the previous or following immunosuppressive treatment affects the appearance of these rare tumors. Despite that clinicians who observe patients after solid organ transplantation have to consider the possibility that such tumors could appear. To the follow-up guidelines after solid organ transplantation and immunosuppressive therapy screening tumor tests once a year and a prophylactic abdominal echography every 6 months, and if there even minor clinical complaints - an emergency echography with a follow - up whole body CT and other necessary testing. The publication of new information on such rare tumors would contribute to the building of a unified strategy of behavior, confirming the relationship between solid organ transplantation, immunosuppressive therapy and the development of desmoid tumors. Author contributions: Atanassova A Y is responsible for the primary content, manuscript creation, selection of abdominal ultrasonographic images, endoscopic examinations and literature review. Chakarov S S provided the CT scan images selection. 1. Shields, C.J., Winter, D.C., Kirwan, W.O., et al. Desmoid tumours. (2001) Eur J Surg Oncol 27(8): 701-706. 2. Einstein, D.M., Tagliabue, J.R., Desai, R.K. Abdominal desmoids: CT findings in 25 patients. (1991) AJR Am J Roentgenol 157(2): 275–279. 3. Rammohan, A., Wood, J.J. Desmoid tumour of the breast as a manifestation of Gardner's syndrome. (2012) Int J Surg Case Rep 3(5): 139–142. 4. Burke, A.P., Sobin, L.H., Shekitka, K.M., et al. Intra-abdominal fibromatosis: a pathologic analysis of 130 tumors with comparison of clinical subgroups. (1990) Am J Surg Pathol 14(4): 335–341. 5. Kempson, R.L., Fletcher, C.D.M., Evans, H.L., et al. Extra-abdominal fibromatosis (extra-abdominal desmoid fibromatosis). In Atlas of tumor pathology I. Tumors of the soft tissues. (2001) Washington, DC: Armed Forces Institute of Pathology 71–87. 6. Kasper, B., Ströbel, P., Hohenberger, P. Desmoid tumors: clinical features and treatment options for advanced disease. (2011) Oncologist 16(5): 682–693. 7. Fleetwood, V.A., Zielsdorf, S., Eswaran, S., et al. Intra-abdominal desmoid tumor after liver transplantation: A case report. (2014) World J Transplant 4(2): 148–152.